(W) Dan Abnett (A/CA) I. N. J. Culbard. WHY WE LOVE IT: We love smart takes on classic science-fiction mythos and who better to take advantage of the iconography of H.G. Wells and War of the Worlds than Dan Abnett, one of comics' most renowned sci-fi writers and one of creators responsible for the groundbreaking run on Guardians of the Galaxy that inspired the upcoming Marvel movie. Paired with I.N.J. Culbard who has made a name for himself with the critically acclaimed adaptation of H.P. Lovecraft's At the Mountains of Madness, it's a team perfectly built for the visually impactful adventure stories readers love. 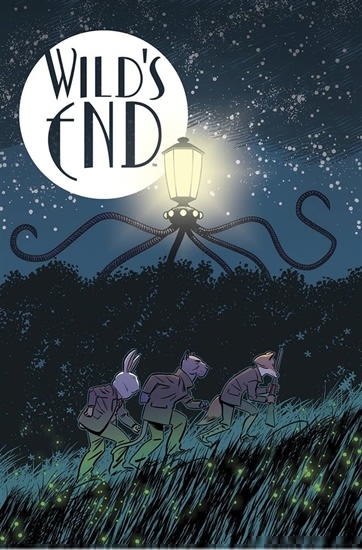 WHY YOU'LL LOVE IT: Inspired by the sci-fi aesthetic of War of the Worlds and the anthropomorphic characters of Blacksad and Mouse Guard, readers will be blown away by Culbard's art while fans of Edgar Wright and Simon Pegg's Cornetto Trilogy (SHAUN OF THE DEAD, WORLD'S END) will fall in love with Clive, Peter, and Gilbert as they try to survive an alien invasion. WHAT IT'S ABOUT: When a rural English community of the 1930s is the victim of an alien invasion, the residents' lives are upended by the harsh realities of life-and-death violence. Led by the town's outsider and retired war veteran, they will have to rally together to uncover the secret of their invaders and ultimately fight back.